IMAP (Interstellar Mapping and Acceleration Probe) is a mission in NASA's STP program to monitor the interactions between solar wind and the interstellar medium in the outer solar system from the Sun-Earth L1 point. It will sample, analyze, and map particles streaming to Earth from the edges of interstellar space. The IMAP mission will help researchers better understand the fundamental mysteries that occur at the boundary of the heliosphere, a sort of magnetic bubble surrounding and protecting our solar system. This region is where the constant flow of particles from our Sun, called the solar wind, collides with material from the rest of the galaxy. This collision limits the amount of harmful cosmic radiation entering the heliosphere. IMAP will collect and analyze particles that make it through. The spacecraft will be positioned about 1.5 million kilometers away from Earth towards the Sun at what is called the first Lagrange point, or L1. 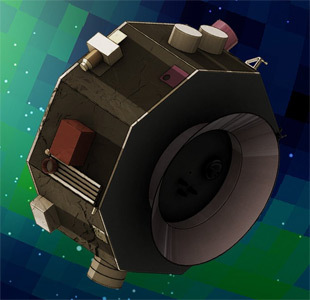 This will allow the probe to maximize use of its instruments to monitor the interactions between solar wind and the interstellar medium in the outer solar system. IMAP was selected in June 2018 following an extensive and competitive peer review of proposals submitted in late 2017. The mission is cost-capped at $492 million, excluding cost for the launch vehicle. The mission will carry 10 science instruments provided by international and domestic research organizations and universities.